An architectural rendering for M2 Partners’ approved Merritt Apartments redevelopment. 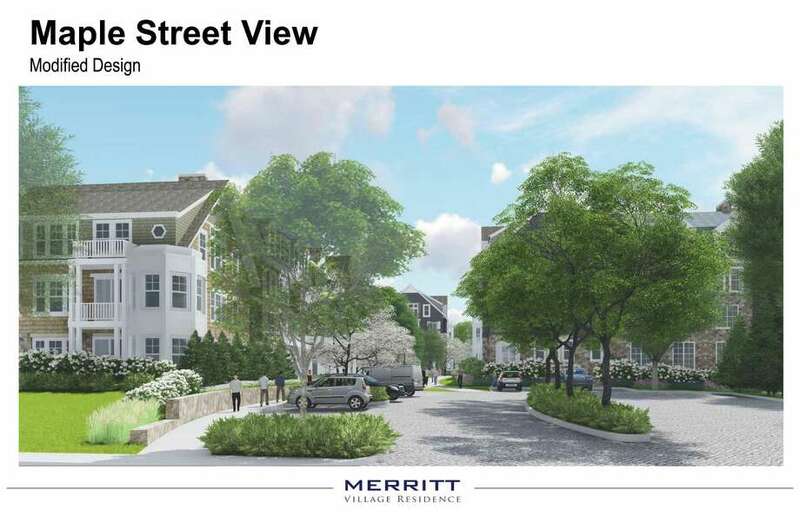 NEW CANAAN — The Planning and Zoning Commission approved a much-reduced Merritt Village proposal at its Nov. 29 meeting, but it remains unclear whether or not the much-debated project will come to pass. The plan was originally proposed in June as a 123-unit, four-story redevelopment and later cut to 116 units. Over months of public hearings and comment and back-and-forth between the commission and M2 Partners, the applicant, the proposal was scaled back on Tuesday night to allow for no more than 110 units — half of which will be rentals, the other half condos — at three stories closest to the street and four stories in areas further set back. “I don’t think it’s a victory,” Arnold Karp, principal of M2, said after the meeting. Size, scale and density were high on the list of concerns for commissioners and residents alike throughout the process, but they were not the commission’s only caveats on Tuesday. It was only with more than 60 conditions that the commission approved a site plan and special permit submitted by M2 which would effectively create an “overlay” zone that would allow for increased density on the 3.3-acre site, where 38 residential units currently sit. Among the conditions discussed were protections for the adjacent Maple Street Cemetery, restricting a “common” building to one story with no residential units above and restrictions during construction. A full list of conditions was to be made availablesometime Wednesday afternoon on newcanaan.info. Karp and attorney Steve Finn, of Stamford-based Wofsey, Rosen, Kweskin and Kuriansky, said after the meeting they need more information before they can say whether the redevelopment is feasible. Because of his concessions in height and the number of units over the past months, Karp said he didn’t consider the approval a victory at that point. “Until we see the actual approval, it’s hard to give any real substantive comments. They (the commission) only refer to them (conditions) in bits and pieces. It’s very hard to understand when they’re making changes what the actual text of the condition is,” Finn said. In individual statements preceding the approval, the commission members, however, largely felt they had conceded too much to the developer. Chairman John Goodwin said the scope of the project was not ideal, but was possibly the lesser of two evils when faced with the threat of the town being susceptible to 8-30g affordable housing loopholes that can be used as leverage by developers. “I would’ve love to have been a hero and been at three stories, 85 units, but I just don’t think it’s the right decision,” Goodwin said. State 8-30g laws require that municipalities strive to make 10 percent of their housing stock affordable. Failure to do so opens the town up to private developers who, as long as they’re willing to designate a certain number of units affordable, can skirt zoning regulations and build projects that otherwise would not have been approved by the town. Goodwin said he felt compelled, in part, to approve the diminished approval because the applicant “indirectly referenced” the idea of an 8-30g application. He felt, should the commission turn down the proposal, New Canaan could see a more imposing site plan, with less control over its fate, from the same developer using the 8-30g loophole. Commissioner Jack Flinn’s concern over the project had mostly to do with its possible effects on the character of the town, an argument heard often in public hearings from residents fearing Merritt Village would be a step away from the quaint, New England village and a step toward a more urban downtown. Flinn said that of the letters received by the Town Planner’s Office, only 23 were in favor of the development, while 81 opposed. He said 22 petitions with hundreds of signatures had circulated asking the commission to either deny or modify the application. “I’m not happy with it. I really really wanted to see it stay at the three-story level and not break the four-story ceiling. I think that by doing that we’re not protecting the character of the town,” Flinn said, though he said the town had a very good builder and he felt the commission got the best compromise they could have. “I think it’s a need for New Canaan. We don’t have rentals and we don’t have any place for our seniors. So it’s not a victory for me. It’s not going to fill the housing that is sorely needed in this community,” Karp said.